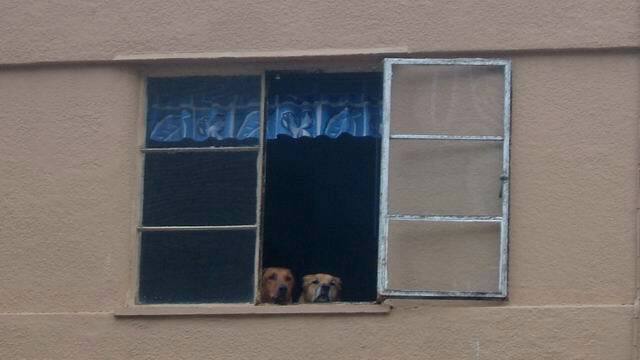 On a thick foggy day, when I was walking around the white Downtown, I came across these window dogs. They were looking up at the foggy sky. I don't know what they were really thinking about, but they seemed to be waiting for the blue sky like me. Then hours later, I remembered that dogs are all color blinded. If so, the clear blue sky and the foggy white sky might look same. Dogs have a lot of expressions but we can't understand what they are actually thinking about. These two dogs might have been just hungry and waiting for the owner come back to feed them. Is this a contrary way of looking at things? 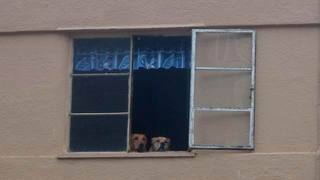 On a thick foggy day, when I was walking around the white Downtown, I came across these window dogs. They were looking up at the foggy sky. I don't know what they were really thinking about, but they seemed to be waiting for the blue sky like me. Then hours later, I remembered that dogs are all color blind. If so, the clear blue sky and the foggy white sky might look the same. Dogs have a lot of expressions but we can't understand what they are actually thinking about. These two dogs might have been just hungry and waiting for the owner to come back to feed them. Is this a peculiar way of looking at things? Oregon also appears to be one state with very lttlie military industrial complex presence....maybe there is a connection thereA connection between 'radio' and the 'industrial military complex'* seems dubious. Frankly I'm not sure what 'access to radio' means in this context. Outside the valley radio reception is complicated by two mountain ranges and, frankly, distance between population centers.As for the IMC - there aren't many bases in Oregon, granted. In the early days there wasn't much there to protect, so any legacy presence is going to around Portland. I recall there was at least one SAC field in Central Oregon, probably others, now shut down.You might chalk up the absence of IMC to industry (sparse out side the valley) and that Oregon's population is 3.5 million - 28th in the Union and it's industrial base is big on lumber and wood products, tourism, food processing, paper products, machinery, scientific instruments and short on death machines.I'll bet that a lot of the paper you shuffled in the Air Force came from Oregon, however. *However you define that. I assume you mean a combination of DoD bases and industry devoted to servicing same.